Mr Mahesh Shah, the General Manager of De United Food Industries Ltd (DUFIL) has said that the Spelling Bee competition provides a great platform to train the country's future leaders. According to him, the hard work, the discipline, public speaking and the spirit of fair competition are great qualities that prepare people for leadership. Speaking on the sidelines of the 2018 national finals of the Spelling Bee contest in Accra, Mr. Shah said parents would do their wards a great service by enrolling them into the competition as they would be setting them up for great leadership roles in the near future. Indomie has been a major sponsor of the spelling competition from its initial stages in Ghana and has pledged to continue to support it because its goal is in line with the values of Indomie, Mr. Shah stated. According to him 'the Indomie brand loves to support any kind of child development initiatives because we believe children are the future of the nation'. 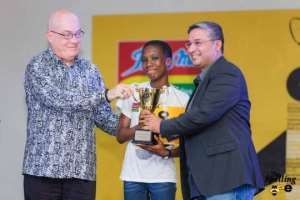 A 12-year-old Shifa Amankwa-Gabbey emerged winner of the 2018 edition of the National Spelling Bee Championship. The Junior High School student from Nagie's Angels Educational Centre in Kumasi in the Ashanti Region beat over 150 other spellers from various schools across the country to take home the ultimate prize. Raj Thakwani, 11 and Akshaya Lakshika Janikiraman, 12, of Delhi Public School International in Tema also emerged first and second runner-ups respectively. For her prize, Shifa Amankwa-Gabbey received an all-expense paid trip to the United States to represent Ghana at the 91st Scripps National Spelling Bee. She also received an engraved trophy, GHc5, 000 scholarship from Indomie, plus $500 per diem among other prize items. Mr. Shah congratulated Miss Amankwa-Gabbey for her sterling performance and urged her to work hard to bring more laurels to the country when she competes on the global stage. He also commended the Young Educators Foundation for expanding the competition beyond the national capital, adding that 'today, we have the champion from Kumasi, next year it could come from another region, which is a great source of motivation for children that they can make it from any part of the country'.